Italian cuisine and pasta have become synonymous everywhere. But somehow I have seen people here (in India) obsessed with only two kinds of pasta – in red sauce or in white sauce. Well you can make pastas even without the same old sauce. How about pasta with pesto? 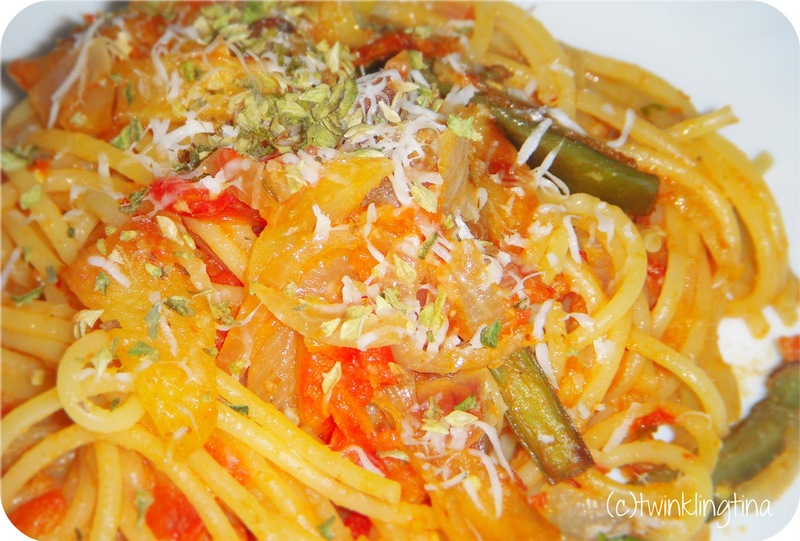 A classic recipe from Trapani – it’s a small province of Sicily. Italians love their pomodoro & basilico and so do I. [tomato & basil respectively]. This is a David Rocco inspired recipe btw. Pecorino cheese – as much you like! Making this Pesto alla Trapanese is very simple. In a frying pan heat some olive oil and pan fry the eggplant & potato slices. [Before frying I dust them with little salt usually, that helps is reducing the water and lessens the frying time]. Take out of flame and drain excess oil on a kitchen paper. Cook the spaghetti in hot boiling salted water for 15 mins or till it’s just becoming soft. Don’t overcook it – it will just start falling apart. Now here’s my twist – Put the tomato pesto in the frying pan, add the cooked spaghetti & fried potato & eggplant and toss them together. Add some thyme and 1 ladle of the pasta water. It really helps to get the pasta together. Add a generous amount of grated pecorino cheese. And you are done – add a sprinkling of oregano and enjoy! You have made me want to try this – Yummy photo and lovely description! You have made it sound so simple yet so yummiliciuos. This is on my menu today.